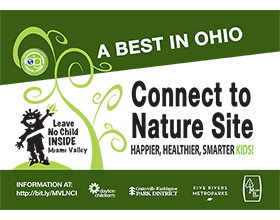 Bill Yeck Park has been named a “Best in Ohio Connect to Nature Site” by Miami Valley Leave No Child Inside and Dayton Regional Green! Grant Park became a site in April. We appreciate the recognition and are more than happy to do our part! The Leave No Child Inside movement brings attention to the critical role that nature plays in healthy childhood development. It addresses some of today’s most pressing problems related to children, including obesity, stress related mental health, low self-esteem, poor academic performance and unhealthy environments. To nominate an agency, school or business that is doing a great job connecting children to nature, visit Miami Valley Leave No Child Inside!